Newfound Lake is a glacial lake of over 4,400 acres. This lake is over 160 feet deep and has some of the best lake trout and small mouth bass fishing in the northeast. One condo is free standing with 5 bedrooms and 4 bathrooms. This unit has perfect sunsets with a first floor master suite with hot tub. Many upgrades including sauna, stone fireplace, new deck and new roof. Amenities include 11 tennis courts, playground, mooring and day-dock, sandy beach and waterfront gazebo for family gatherings. The second condo also in Bridgewater. This immaculate condition waterfront home boasts an open concept contemporary flair spread over 3 floors that inspires you to relax and entertain with family and friends. Outside includes a screen porch, sundeck and private patio. 2 private sandy beaches, association boat mooring field, recreation hall and tennis court all steps away and surrounded by beautiful lawns and gardens in this friendly lake front community. 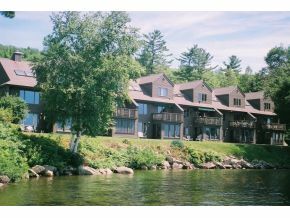 Because most agree that this is the "best location on the lake", these townhouses rarely come on the market. Listed by Coldwell Banker Old Mill Properties. In the summer in addition to all the lake activities there is plenty of hiking trails and golf near by. 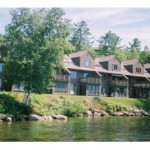 In the winter you are a short drive to Ragged Mountain or Loon for skiing and you can snowmobile to Canada. 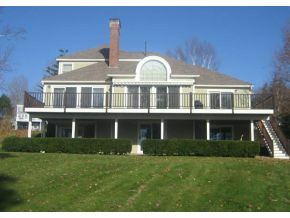 For additional information on this home call Lady of the Lake Realty at 1-888-737-5550 or e-mail at info@nhlakesrealty.com or visit our website to view similar lake homes in New Hampshire at or www.lakeorskirealestate.com.